STUTTGART Germany — NATO’s military edge over Russia could soon be threatened if allies fail to keep adapting, the alliance’s top general warned on Wednesday. U.S. Army Gen. Curtis M. Scaparrotti, NATO Supreme Allied Commander Europe, said Russia’s military modernization efforts are challenging allies in a range of areas such as cybersecurity. 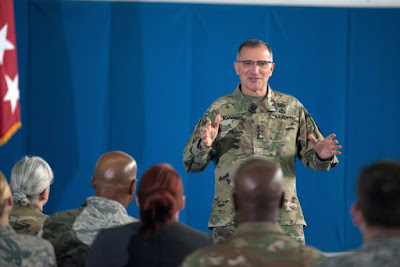 “Because of the modernization they’ve made, while we are dominant, we will not be in five years ... if we are not adapting,” Scaparrotti said during a news conference at NATO headquarters in Brussels. Scaparrotti, who also serves as head of U.S. European Command, said he and his Russian counterpart, Gen. Valery Gerasimov, have agreed to meet soon in an effort to improve communication and reduce the risks miscalculation. The meeting would be the first face-to-face encounter between the top NATO and Russian commanders since Moscow’s 2014 intervention in Ukraine. WNU Editor: The U.S. and NATO spend 20x what Russia spends on defense .... Russia will not close the gap with NATO.